10/23/18 - Thank you Western Digital for your financial support and for helping to build playhouses for military families. See more photos. 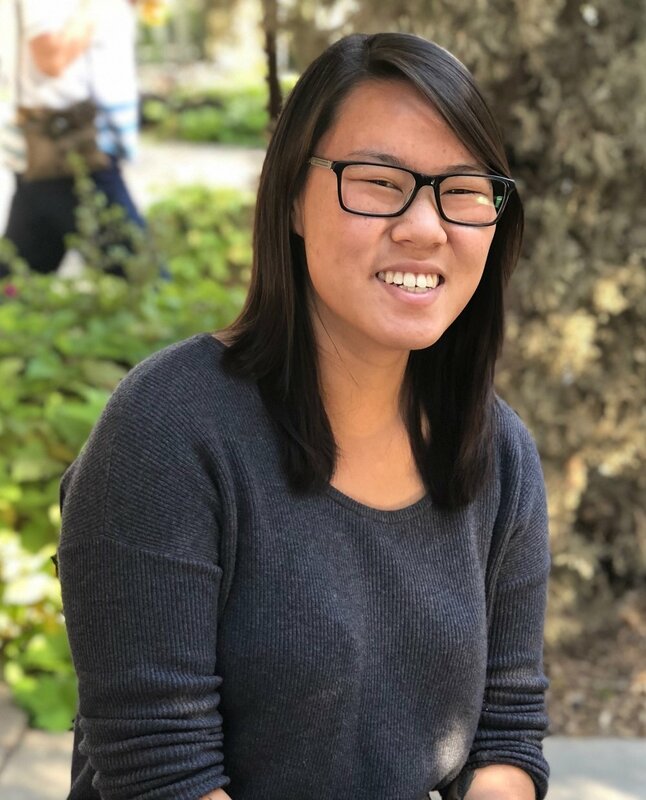 10/22/18 - Welcome Delaney, our newest AmeriCorps National Construction Lead. We are grateful to your commitment to a year of service with St. Vrain Habitat. Learn more about AmeriCorps and read Delaney’s bio. 10/20/18 - We’re so excited for our Habitat Homeowner, Ale Robles, who won a vintage makeover at the 300 Suns/The Hop’s Cool Cat Bash. Thanks to all you Cool Cats who helped raise over $1300 through the silent auction and vendor fees. See more photos from the event/Ale’s finished look on Facebook. 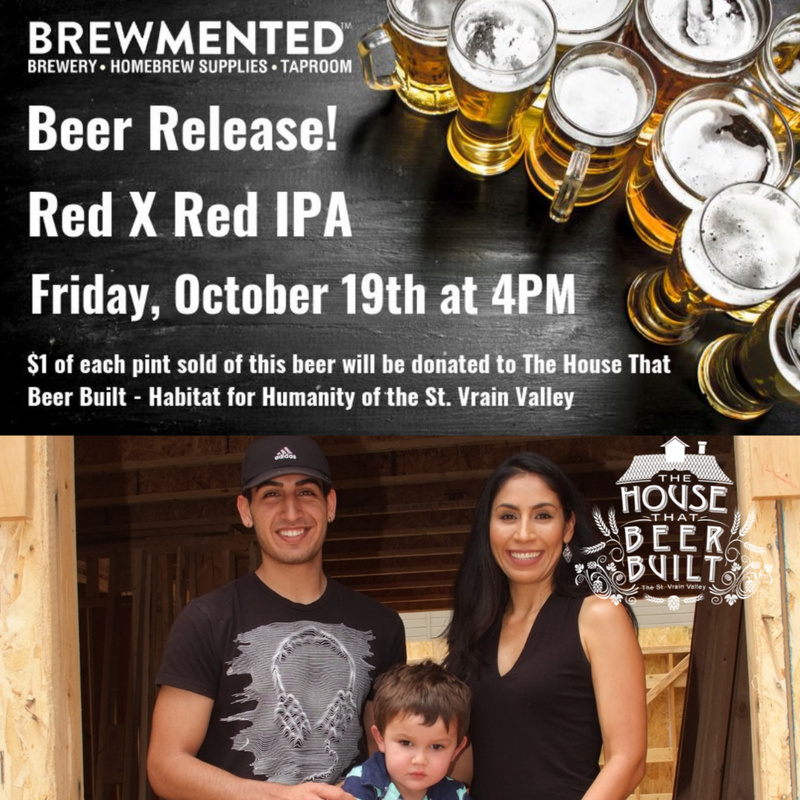 Learn more about House That Beer Built and upcoming events. 10/19/18 - Thank you to Mindy from Xilinx for her passion and commitment to volunteering and inspiring volunteers with St. Vrain Habitat. Mindy won the Community Champion Award at the Denver Admin Awards ceremony. Congrats Mindy! We are grateful for your leadership. Learn more about corporate volunteerism with St. Vrain Habitat. See more pictures of Mindy. 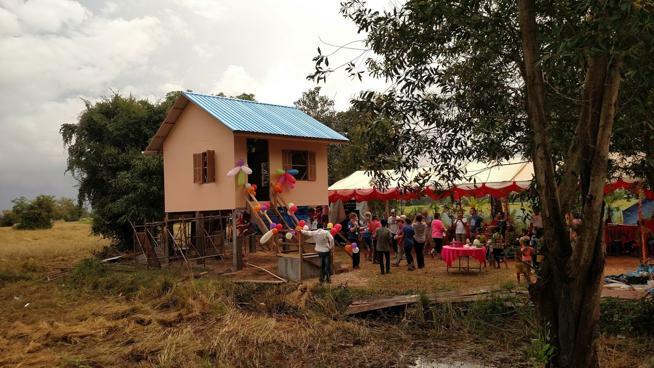 10/15/18 - Dream Finders Homes partners with Habitat for Humanity of the St. Vrain Valley and Bridges to Community to build affordable homes abroad. We are grateful for this unique opportunity. Learn more in the Longmont Times-Call article. 10/12/18 - Thank you Micron Technologies, Inc. for participating in an Adopt-A-Day on our Poplar Grove site. You are helping us #buildabetterfuture. See more pictures from on-site. 10/13/18 - Join us for our BIG Fall Event in celebration of St. Vrain Habitat’s 30th anniversary and the ReStore’s 12th anniversary. Shop great deals - 30% off storewide (some restrictions apply). Enjoy good eats - purchase lunch from Samples Food Truck. Craft spooky luminaries - and participate in other activities (while supplies last). 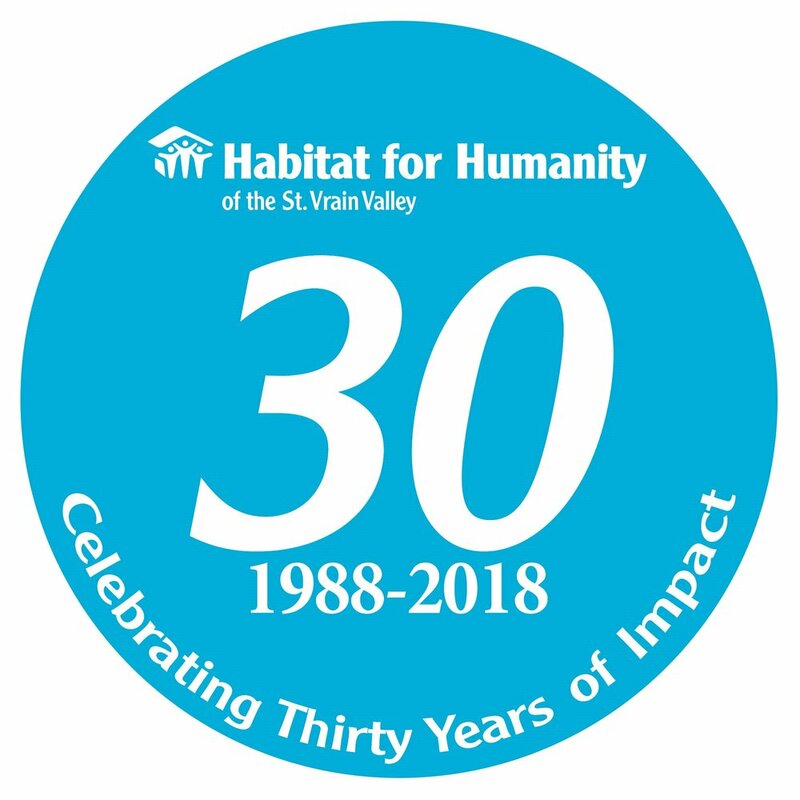 10/11/18 - St. Vrain Habitat is celebrating 30 years. Established in 1988, we have built nearly 100 homes locally and financially supported more than 170 homes around the globe. We are proud to build in the St. Vrain Valley and partner with families in need to make affordable housing a reality! Thank you for your generous financial and volunteer support, and we look forward to continuing our partnership with individuals, families, businesses, churches, community organizations, and government officials. 10/5/18 - Thank you Wibby Brewing. Our brewery partner brought volunteers, including the owner, to our House That Beer Built site in Longmont. We appreciate our business partners taking the time to help us #buildabetterfuture for a local family. 10/3/18 - Welcome to our new AmeriCorps Construction Crew Lead, Mitch Calvin. Mitch has an engineering background and is excited about the opportunity to engage in the work of Habitat and serve the St. Vrain Valley community. Read more about Mitch and the AmeriCorps. 10/2/18 - Thank you to our corporate sponsor, Harris for sending volunteers for another successful Adopt-a-Day. See more pictures on Facebook. Learn more about corporate partnerships and our corporate partners. 10/1/18 - In honor of World Habitat Day, friends and supporters of St. Vrain Habitat pinned pictures and stories to different places they’ve been to with us on a map. View the stories and map here. Learn more about Global Village Trips and sign up for our next trip - Let’s go Lesotho! 10/1/18 - October 1st is World Habitat Day! “Affordable housing is not a problem unique to Colorado’s front range. It is an issue that needs to be tackled on every continent. Dream Finders Homes is addressing it with a unique program in the homebuilding industry. In their new development, The Parkes at Stonebridge in Longmont, Colorado, when a buyer decides to purchase a Dream Finders townhome, they will also select a village in one of four countries where Dream Finders will provide funding to build another home for someone in need.” The builder, Dream Finders Homes has committed $100,000 to this effort! Read more about Dream Finders Homes and their partnership with St. Vrain Habitat.